Although not meeting the speed requirement, state transportation officials say the toll lanes on Interstate 405 save drivers between Lynnwood and Bellevue 11 to 14 minutes on average. After two years in operation, the Interstate 405 express toll lanes are still missing their legal requirement to move traffic at least 45 mph on average at peak hours, 90 percent of the time. Managers at the Washington State Department of Transportation (WSDOT) intend to keep the lanes in place anyway. They point to data showing drivers between Lynnwood and Bellevue save 11 to 14 minutes when they pay to enter the toll lanes. And a new afternoon-only lane northbound approaching Lynnwood has reduced pressure. But at the morning chokepoint southbound through Bothell, toll lanes slowed to an average 23 mph at the worst time of 7:35 a.m., and averaged only 42 mph there in a four-hour commute window, the data show. That pulls the overall performance down, so the entire 15-mile corridor meets its speed standard only 81 percent of the time. Are the toll lanes in jeopardy? WSDOT says no. The agency construes “and” to mean express toll lanes won’t be terminated unless they fail both the speed requirement and the revenue test, which the lanes are easily passing, said Patty Rubstello, urban-mobility director. That argument has a couple key legislators riled up. He even suggests switching toll-lane signs to say “open to all” this weekend, and leaving it that way until the 2018 legislative session. Express toll lanes let solo drivers escape congestion by paying between 75 cents and $10 to enter a faster left lane. To use them for free, carpools must carry at least three people at peak times. Two toll lanes run alongside at least three general lanes each way between Bellevue and Bothell. But between Bothell and Lynnwood, only one toll lane and two general lanes go each way. By some measures, I-405 is doing fine. The lanes met their 45 mph goal about 81 percent of peak hours, for the first half of this year, compared to 62 percent two years earlier, in conventional two-person carpool lanes, WSDOT reported. Peak times are 5 a.m. to 9 a.m. southbound, and 3 p.m. to 7 p.m. northbound. Transit agencies report saving 10 minutes a trip with the lanes. However, the Bothell chokepoint is bad enough that buses are allowed onto a southbound shoulder, to escape traffic jams. In the roomy Kirkland section of I-405, average speeds improved over the past two years from 49 mph to 57 mph in the express lanes during the southbound morning commutes. “They’re providing a faster trip for people when they need it during the peak hours,” said tolling director Ed Barry. Even in the general lanes, morning speeds improved from an average 35 mph to 41 mph through Kirkland, WSDOT reported. The 45 mph goal was picked because it maximizes traffic flow, so 2,000 vehicles can squeeze through per hour per lane. At faster speeds, there’s more distance between cars, and lower volumes. At very slow speeds, fewer cars per hour reach a destination. An algorithm raises the toll toward $10 whenever traffic slows. As tolls rise, some drivers are deterred, and the lane is supposed to sustain at least a 45 mph flow. Recent data show this effect. Each express toll lane carries 400 more cars on average than a slower general lane in the busiest peak from 7:30 a.m. to 8:30 a.m., in the two toll lanes each way from Highway 522 to Bellevue. During that busy hour, drivers in the general lanes move at an average 34 mph, watching their neighbors zip by at 54 mph in the toll lanes. An independent performance study, requested by skeptical lawmakers, is being conducted by a University of Minnesota team at a cost of $160,000, due Dec. 14. To bring some relief, the state in April opened a 1.8-mile “hard running shoulder”to provide additional capacity in the afternoon for northbound drivers into Interstate 5 at Lynnwood. Preliminary checks show a 10-minute savings for general traffic there, WSDOT said in July. “Things are getting better,” Sen. Guy Palumbo, D-Maltby, said by phone, while driving the toll lane. Yet he said problems persist with diverted traffic filling neighborhoods, to enter I-405 south of the big chokepoint. Rubstello said the shoulder lane should nudge the overall performance rate of toll lanes nearer to 90 percent by year’s end. Mariya Frost, analyst at the Washington Policy Center, argues that the Lynnwood shoulder lane proves more general capacity, not tolls, is the solution for congestion. Transportation committee chairman King suspects speeds in Kirkland still would have improved if the new lanes WSDOT built as the second toll lane each way had been created as general lanes instead. The expansion cost $156 million, paid through gas taxes. Rubstello counters that whenever general lanes are added, they soon fill up again. The requirement in state law that the toll lanes pay for themselves isn’t a problem. Express lanes raked in $24 million above collection costs in the first 21 months, a fiscal statement says. Of that, $11.6 million was spent to create the northbound shoulder lane. By law, surpluses must be reinvested along I-405. Rubustello said there’s no proposal to raise the $10 toll ceiling, although a $15 maximum was briefly discussed last year. 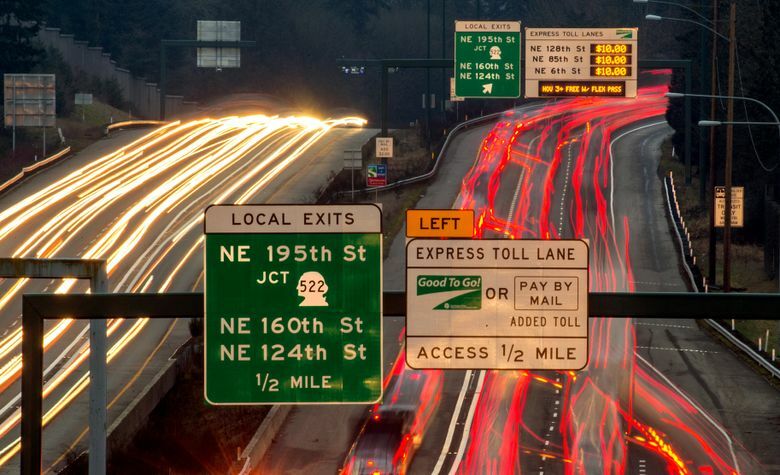 Toll proceeds could be lucrative enough to support bond sales in the 2020s, to stretch a second toll lane each way between Highway 522 and Lynnwood. That might cost around $450 million, including bridge widenings over the Sammamish River. “WSDOT’s looking into this. If the Legislature decides to authorize such a project, that’s something that might be possible with the toll fund,” spokesman Ethan Bergerson said. Gas taxes won’t be raised anytime soon, said King, because the state just increased those 11.9 cents a gallon in 2015-16, to support $16 billion in statewide projects. These include widening I-405 from Bellevue to Renton, where in 2024 there would be two toll lanes and two general lanes each way. The state budget contains $5 million for preliminary engineering of additional toll lanes north of Bothell. As the state explores more projects, jobs, population and travel demand are expected to keep growing.